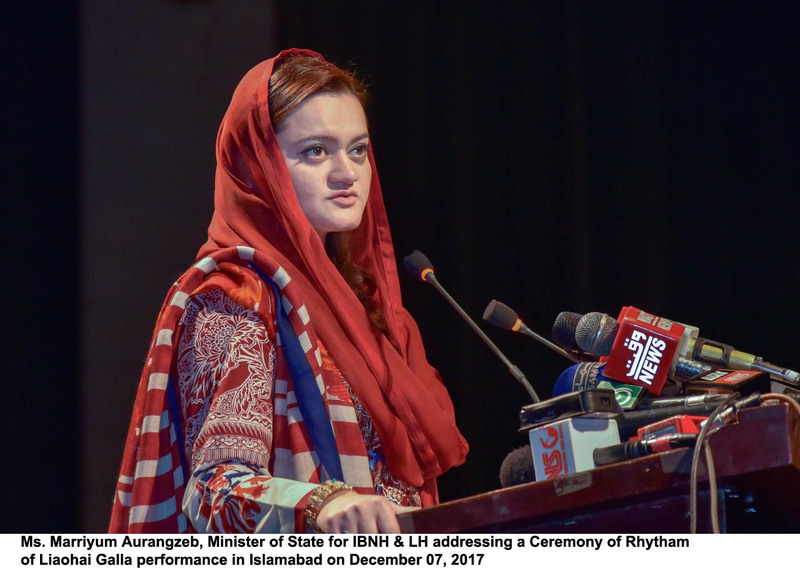 ISLAMABAD: Dec 7,2017-Minister of State for Information, Broadcasting, National History and Literary Heritage Marriyum Aurangzeb Thursday said that cultural ties between the countries were a means to promote people-to-people contacts. She was speaking as the chief guest at a Cultural Gala co-sponsored by Chinese Cultural Center and Chinese Embassy at the Pakistan National Council of the Arts here. The minister said that PNCA was playing key role in inviting cultural troupe from all over the world and arranging their performance on it premises. The minister observed that the Ministry of Information and Broadcasting was also striving to project Pakistani culture and heritage in the same context. She said, “We are a peace loving country and our culture and national heritage are our real identity. We want to be known as a country having vibrant youth and a unique culture.” The minister said that they would fight against terrorism through culture, arts and national heritage. She said that the people of China and Pakistan considered each other’s country as their home. The minister said that the relations between Pakistan and China spanning nearly seven decades not only pertained to the economic sphere but were also based on unique cultural values and heritage, which were gaining strength with every passing day. Marriyum said that those relations were deeper than the sea, higher than the mountains and sweeter than honey. The minister said that China had always stood by Pakistan during the testing times, in the journey towards development, battle against terrorism, ending the energy crisis and any other avenue where Pakistan needed its support. Marriyum said that the future of posterity of the two countries was linked with CPEC as it would impart more and more depth to the bonds between the two countries. She said that China had made the biggest ever investment in Pakistan through CPEC and the completion of this mega-venture would impart eternity to the relations between the two countries. She said that exchange of cultural delegations helped in understanding the cultures of each other. Marriyum said that the youth of Pakistan had been detached from their cultural values and it was the endeavour of the government to reconnect them with it, so that a positive image of Pakistan could be projected among the comity of nations. The minister said that democracy was on the right track in Pakistan and people must use their vote to elect their true representatives on the basis of performance. Marriyum reiterated that it was the power of vote that created Pakistan; made it a nuclear power; ended load-shedding in the country and was turning it into an economic power in conformity with the vision of the former Prime Minister Muhammad Nawaz Sharif. She said that the country had faced the scourge of terrorism for the last 35 years and as a result of the efforts of the present government there had been a 90% decrease in the incidents of terrorism. The minister revealed that the Ministry of Information was also taking concrete measures for the revival and development of the film industry. Chinese ambassador to Pakistan Jio Jing, DG PNCA Jamal Shah, cultural counselor of China and Deputy Director of the Chinese Cultural Centre were also present on the occasion. The Chinese ambassador also addressed function and artists from both the countries enthralled the audience.